Cultivating a resilient, vibrant region where human and natural systems thrive. On the last day of the Spotlight Stewardship course we visited San Vicente Redwoods. Participants were introduced to the property and the various stewardship issues associated with it by Dan Olstein from Peninsula Open Space Trust, Laura McLendon from Sempervirens Fund, Rich Sampson from Cal Fire, Chris Coburn from the Resource Conservation District of Santa Cruz County, Janet Webb from Big Creek Lumber, Val Lopez from the Amah Mutsun Tribal Band, Mike Powers from the Bureau of Land Management, independent forester Nadia Hamey, and consultant Jim Robins. Laura McLendon from Sempervirens Fund explains the history of the property to the Spotlight Stewardship participants. Val Lopez shares history of the Amah Mutsun in the region. Spotlight Stewardship participant Loretta Moreno at San Vicente Creek. The Spotlight Stewardship program is designed to bring community leaders out on to the land to learn about land stewardship issues. We currently have a fantastic cohort of seventeen community leaders participating in the four-day program. On day one we visited Mindego Ranch, Midpeninsula Regional open Space Trust's property in Redwood City. 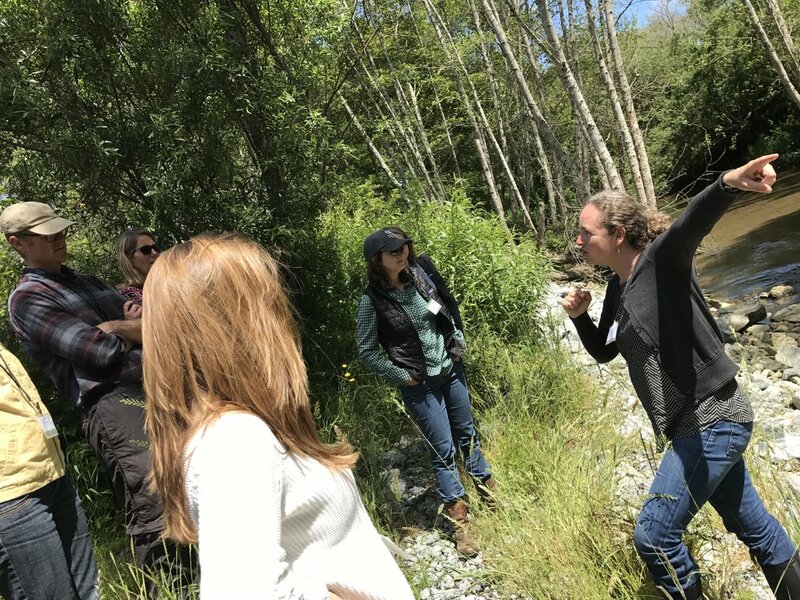 On day two we visited the Pescadero watershed and looked at a stream restoration project done by the San Mateo Resource Conservation District. 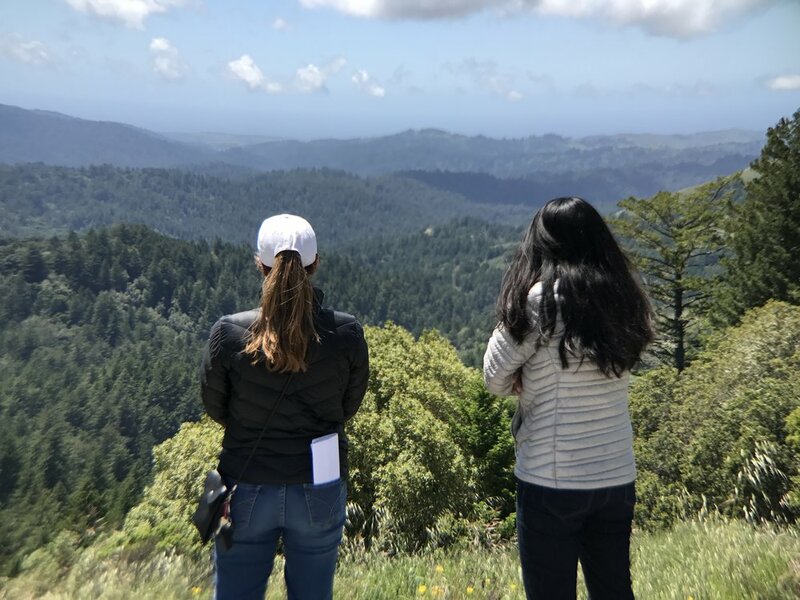 On day three we visited Land Trust of Santa Cruz County's Byrne Forest, as well as the privately-owned Estrada Ranch in Corralitos. Our last and final day we'll visit San Vicente Redwoods near Davenport. 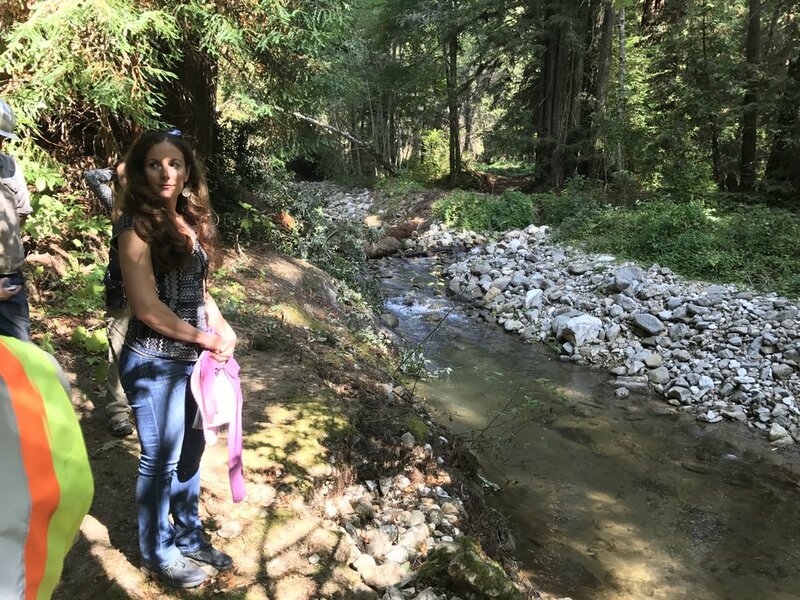 Irina Kogan of the San Mateo Resource Conservation District highlights aspects of a stream restoration project in Pescadero. june 9th, 2017. Lunch at Deer Camp at Estrada Ranch. August 4th, 2017. Check out the great article by the Santa Cruz Sentinel about the Network. The article makes a nice mention of our Spotlight Stewardship program. Check out the fascinating story of the research that one of our members, the Amah Mutsun Land Trust, has done that shows that the Amah Mutsun have been doing prescribed burns in the region for at least the last 1000 years. "Ten years ago, a group of researchers led by UC Berkeley Professor Kent Lightfoot came to the Amah Mutsun Tribal Council with a novel kind of proposal. 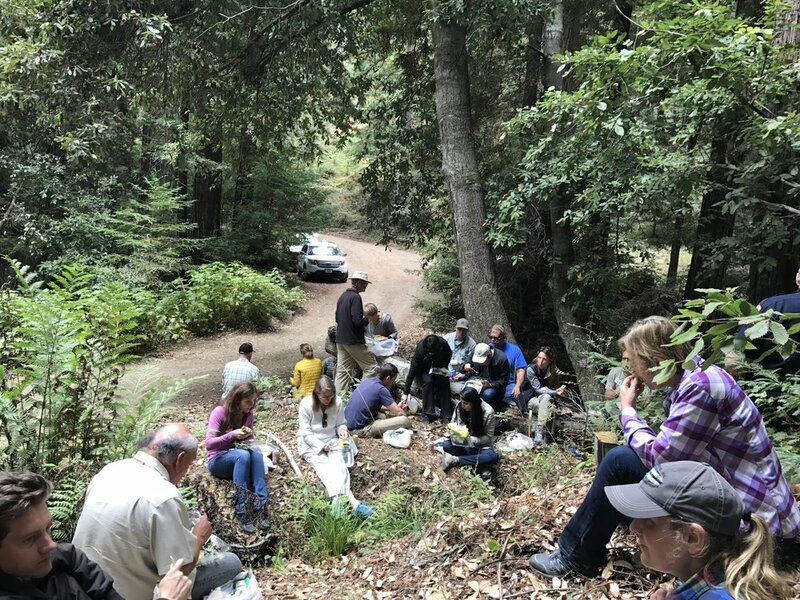 They wanted to work with the Tribe and State Parks to begin a scientific project to learn more about the long term history of relationships between Native people and the natural world at Quiroste Valley, located near Año Nuevo Point in San Mateo County. A primary goal of the project was to investigate whether Native people used prescribed burning as a stewardship method to maintain open and productive landscapes long before the arrival of Spanish colonists. The research project would bring together many different types of academic and scientific methods in a framework we call “integrative historical ecology.” Under this approach, researchers recognize that no single method or discipline can provide a complete picture of complex human-environment relationships. So we try to understand ways of life in the past using a diversity of perspectives that can include documentary histories, oral traditions, archaeology (the study of physical materials created and used by people in the past), ecology (how animal and plant communities function and interact), and paleo-ecology (how biotic communities were structured and functioned in the past)." 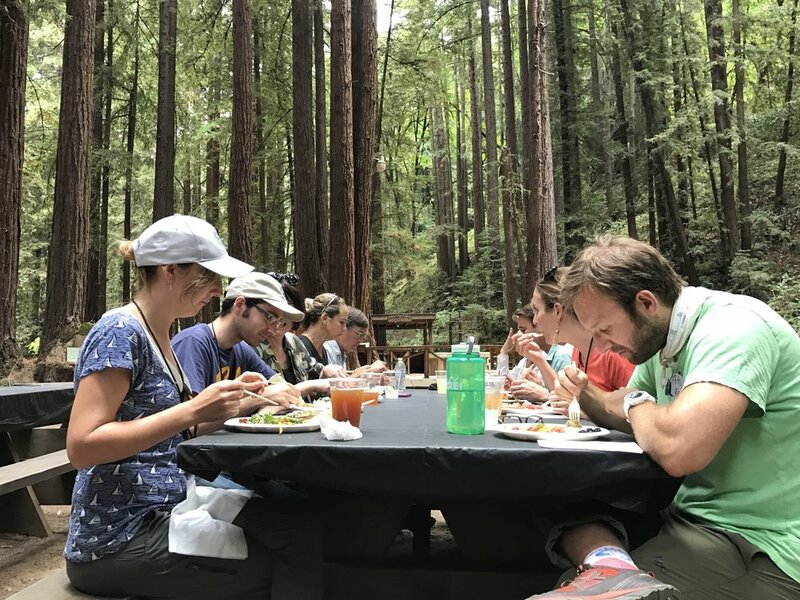 The Santa Cruz Mountains Stewardship Network is a region-wide and cross-sector collaboration of independent individuals and organizations who are committed to working together to help cultivate a resilient, vibrant region where human and natural systems thrive for generations to come.